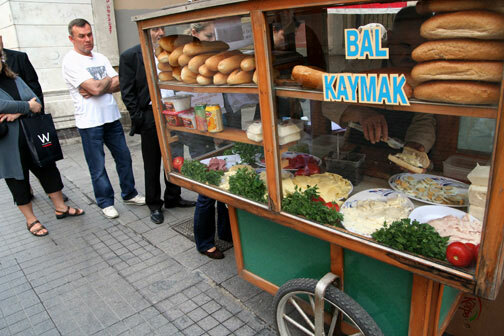 Demir is part of Istanbul’s great food on wheels tradition, with different carts that sell everything from rolls to grilled meatballs making appearances throughout the city at different times of the day, and even according to the seasons. One of our favorite cart snacks can only be had in late spring and summer, when vendors selling peeled and salted cucumbers materialize, only to disappear with the first sign of fall. A whole sandwich will set you back 3.5 lira, while a half loaf – a mini-bomb that should leave most office workers dazed in their cubicle – costs only 2 lira. So, if you happen to be walking down İstiklal during the week, we suggest you drop by Mehmet Demir’s breakfast cart – even if you’re not on your way to work. Day in and day out, this sandwich shop is on a roll. What a great site! I followed you from the foodie blogroll and I couldnt stop reading! I’ll definitely be back to read more! What a delight for the senses!!! The writing in this site might just be better than the food described. This is a place to come back to!!! I’m a hug fan of Turkish food (my husband spent 11 years in Turkey) and your website is absolutely fantastic. it’s nothing but great places to go, new restaurant ideas.. Can’t wait to go back this summer! Great to read this. Heading back to the City of the World’s Desire in October and have already started to make my “list” from your site. Have the recent crackdowns on some Istanbul street-food sellers caused Mehmet Demir to change his location or operation in any way? Hope not. Thanks again for letting me taste this city’s rich culinary treasures as I sit here outside Boston and the snow falls. Mehmet Demir is a legendary man in İstiklal. I eat my breakfast whenever I go to taksim. actually today i was there and i combined my sandwich with large turkish tea http://instagram.com/p/R14HDiSr8p/ . there are lot’s of things to discover in Istanbul and generally their foods are great.. so much fun eating the street foods!! !